If you are planning your own tented event, wedding or otherwise, I cannot stress enough the importance of creating a traffic flow for guests. We chose to place the bar outside and to the side of the tent in order to create a cocktail and appetizer area. This moved guests away from the tent when they arrived, providing the wait staff a clear path to setup the buffet tables and prepare for dinner service. Additionally, be sure to have a clearly marked area for cards and gifts so guests aren’t having to carry them around while balancing their cocktails and appetizers. Another important consideration for a tented venue is lighting. The Bride rented globe chandeliers from the tent company, and strung up tons of twinkle lights around the inside perimeter. There were brief periods of overcast weather right as people were arriving, so I was happy we added the globe lights to create a lovely glow. In addition to vases of hydrangeas on each of the tables, we rented potted plants and trees from a local florist, which made the space feel more intimate and polished. The trees are European Hornbeams and served double duty to provide lighting as well as hide the center poles of the tent. We added white petunias around the tree bases to define the spaces and add even more color. The Groom’s father made the cool wooden circle slabs for each table (you can find some here and here), which ended up being the perfect bases for the hydrangeas. Due to the humidity, the cold water in the vases caused them to really sweat and thankfully the wooden bases absorbed all the moisture keeping the chiffon runners dry. Flameless candles in various sizes, along with table numbers purchased from Etsy, completed each tablescape. Lastly, I created this arbor using a rebar base that the Groom’s father built. I purchased floral cages here and affixed duct taped them into place on the rebar. I soaked the foam overnight because it was over 80 degrees with full sun on the day I assembled it. I was so nervous I kept watering it and thankfully it all held up and stayed fresh! We wrapped it all in an ivory muslin fabric that also held up to the passing showers and humidity of the day. We all had an amazing time, including my kiddos who had the honor of being a part of the flower girl party. The evening was capped off by a visit from the ice cream truck which was thoroughly enjoyed by adults and kids alike. Congrats to B and Z and thank you for letting us be a part of your special day! Happy Monday All! I am so excited that we are getting closer to Spring! February is always a busy month for us as we celebrate birthdays for both my younger daughter and my husband. Such fun! My daughter is much like her mamma in that she always has a “vision” for what she wants her party to be, and this year she drew me a picture of the cake she wanted (no pressure)! The cake is always a big part of our parties because when I was growing up my talented Nana would make us amazing cake creations based upon whatever theme we had dreamt up. I have tried to maintain that tradition for both my kids, and this year my daughter wanted a mermaid theme. The cake was to be three layers, complete with Ariel coming out of the top (as clearly noted in the drawing). So off I went to Michael’s to pick up some pre-made turquoise fondant, which totally saved us in constructing a mermaid tail mere hours before the party began. Let’s be clear, the cake is the highlight, and in order to get it done I order out dinner! I knew I wanted to incorporate edible sand into the cake design somewhere so I chopped up some chocolate graham crackers and vanilla wafers in the Cuisinart, which gave me the perfect consistency to sprinkle onto the bottom frosted layer. 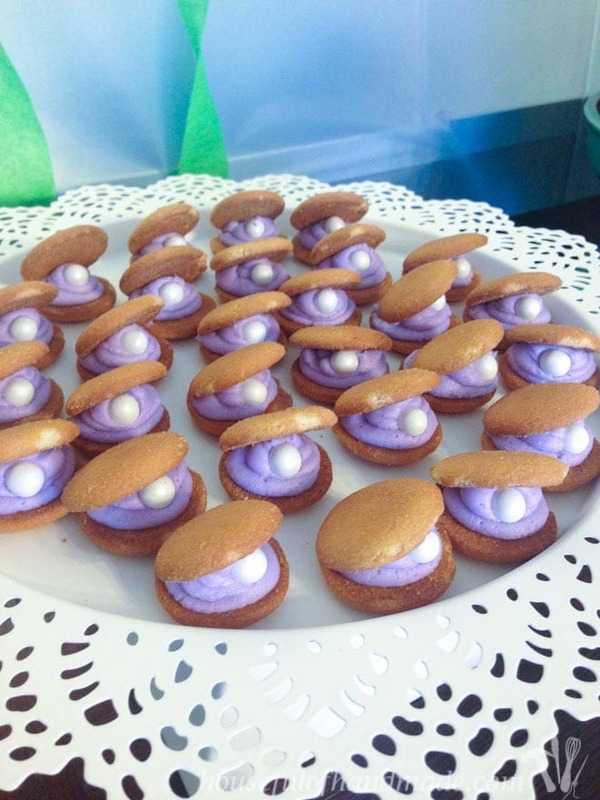 I had additional vanilla wafers left over, so after a little Pinterest research I found this cute idea from Houseful of Handmade to create clams by adding some frosting and a candy “pearl”. My older daughter is eight and loves baking, so she helped me make all the chocolate shells and starfish that we used both on top of the cake, and in the goody bags for our guests. I found some amazing mermaid themed plates from Meri Meri through Amazon, which were a total hit! To complete the mermaid look, I added a coordinating net as a table runner and layered it with some starfish and seashells we recently brought back from our vacation. I also included some gummy sharks in the bottom of the the kids’ glasses to which we added pink lemonade when everyone arrived. I cannot believe my baby is 6! Time please slow down! Happy January all! This past week I surprised myself by de-decorating and packing up all the holiday goodies. In the past, I savored it all until at least the second week of January, but alas the tree, and garland have been taken curbside and the house somehow feels lighter. In the past I would have said empty, hmmmm. In the last few days, with great vigor, I have been happy to embrace January decor…whatever that is! And each year when it all gets packed away with the promise of next year, I think of my Nana. As the story goes she would be so saddened when the Christmas tree was taken down that my Pop-pop, bless his heart, would buy her bunches of flowers to help fill the void, mostly carnations so as to last as long as possible. Nana was totally into flower arranging, entering competitions, taking classes and relishing the nuances of how things “fit together.” I have a lingering memory from her funeral that a woman I didn’t know spoke about my Nana’s love of flowers, and how she would always say that when you arrange them, you have to “give them space to nod.” In essence, don’t just jam them all in there and call it a day. I take this woman’s memory as a gift, and as I pack up my holidays each year I go out and buy flowers and attempt to arrange them in such a way so as to let each one nod. It’s a work in progress but one that always makes me smile.